As the 2017 Faculty Jobs Open Thread has gotten longer, the Blogger software that this blog is run on has added a new wrinkle: when you initially load the thread, it loads only the first ~220 comments and then has a "load more" button near the bottom of the page near the comment box. Only after pressing that button does it load the latest comments. I'm really sorry about this, especially since there's nothing I can do about it. I'm asking you to vote, either in the comments to this post, the comments to the Open Thread or by e-mail to me (chemjobber@gmail.com) to tell me if you'd like a new Open Thread. If there is an overwhelming majority that wants a new thread, I'll be closing the old one to new comments and opening a new one. Again, my apologies for this latest wrinkle. Thanks for hanging in there. Credit: Motley et al. J. Nat. Prod. ...To obtain the large number of microbiome bacteria from diverse mammalian sources that we required for our screening process, we used an opportunistic sampling approach to explore roadkill (animals killed as a result of unintentional vehicular collisions), which is an underutilized source of microbiome bacteria. In our case, we focused on fresh (recently deceased) roadkill comprising mammals that are native or naturalized to central Oklahoma. Roadkill offers a convenient route to accessing microbiome bacteria since it (i) is abundant in many areas, (ii) presents the opportunity for sampling diverse animals and their associated bacteria across a broad geographical region, (iii) alleviates concerns over the trapping and testing of live animals since only carcasses are sampled, and (iv) offers the possibility to conduct chronologically dependent testing of specific animal populations over extended periods. In this paper, we present the development and application of our mammalian-microbiome-derived natural product discovery pipeline (Figure 1) and present data for several new and known depsipeptides obtained from opossum-associated bacteria. In all seriousness, congratulations to Motley et al. for interesting science and a novel source! Is Sister Lioba doing better with her portfolio than you? On a recent morning, Sister Lioba Zahn read the Bible, attended prayer, did the laundry and then prayed again. In the afternoon, she called her bank and started trading. ...For over a century, Mariendonk financed itself by selling milk and candles, and through income on its bank deposits. After the European Central Bank began cutting rates, eventually going all the way below zero to their current -0.4%, Sister Lioba realized her convent needed extra income to survive. “With rates so low, we must get a better return if we want to sustain the convent,” says Sister Lioba, who holds the position of “cellerarin,” a convent’s version of a chief financial officer. Back in 2013, the nunnery’s roof needed repairing and the only car that the 28 sisters owned was nearing the end of its life. Calling her bank, Sister Lioba was offered a seven-year savings bond that carried a 1% annual return. She said she couldn’t believe what she was hearing. “You don’t need to have studied mathematics to see that we were going down,” said Sister Lioba, who had studied psychology. After morning prayer, she gathered her fellow nuns into a wood-paneled room inside the convent and showed a PowerPoint on low interest rates. 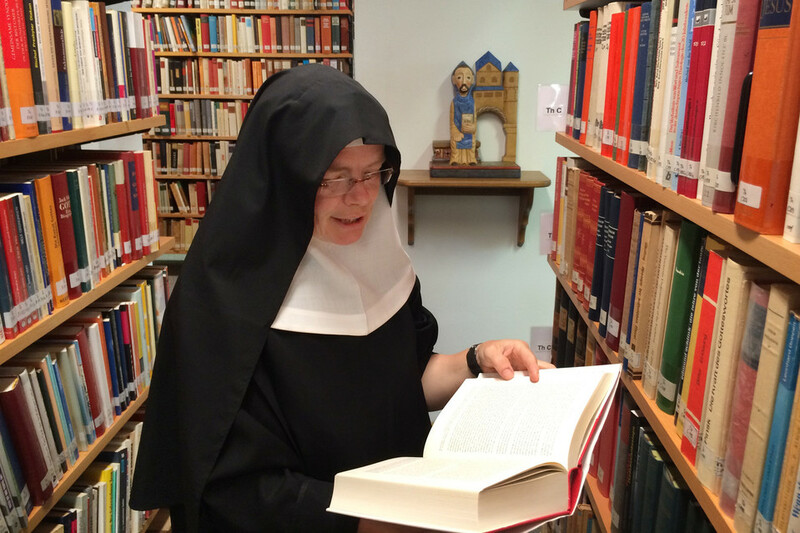 Presiding over the meeting, Sister Christiana Reemts, Mariendonk’s abbess, made an observation. “Twenty years ago we could get enough money from interest to renovate our whole building,” she remembered saying. “Now the interest rate can bring tears to one’s eyes.” In Mariendonk, a decision was made and global markets had a new investor. Sister Lioba now runs a portfolio of roughly €2 million, or $2.1 million, from her convent office. “I started by googling what a swap is,” Sister Lioba says, referring to a derivative that allows an investor to exchange the income stream of one asset with that of another. *Can't get to the article? Google the headline: "Get Thee to a Brokerage! Low Rates Turn Nuns Into Traders"
1. Failure to adequately investigate and document out-of-specification results according to a procedure, and implement appropriate corrective actions. ...For example, according to your Deviation Handling Sheet No.07-2015021, you resampled and tested crude heparin batch Y102-1504005 multiple times, with the following results. You neither evaluated the initial sample OOS, nor conducted retesting of the initial original sample to confirm it. Instead, you resampled until you obtained a passing result. Similarly, your initial test results for another crude heparin batch (Y102-1503008) were also OOS. Again, you resampled without justification, and accepted the batch when you obtained results within specification. The 2017 Chemistry Faculty Jobs List (curated mostly by Andrew Spaeth, with minor help from me) has 497 positions. Have you had a Skype/phone interview (or an on-site) with a position on the Faculty Jobs List? Please add the date of the interview to the open thread. The open thread is here. Our Medicinal Chemistry Department is one of the most critical parts of our research engine. We are looking to greatly expand the size of this department in 2016, with no less than 6 immediate openings for PhD-level chemists with a strong background in synthetic organic chemistry. The Medicinal Chemistry Scientist will be responsible for designing and independently synthesizing novel molecules directed at one or more of our biological targets. He/She will be a key member of one or more of our multi-disciplinary drug discovery teams. As a member of such teams, the Scientist will be responsible for the identification and characterization of novel drug candidates and their advancement into clinical evaluation. This will require the development of a broad working knowledge of various scientific disciplines in addition to medicinal chemistry, including immunology, cancer biology, pharmacokinetics, drug metabolism, and toxicology, among others. With the guidance of our experienced leadership, the Scientist will integrate large amounts of data on previously synthesized molecules into the design of novel molecules anticipated to possess increasingly optimal biological profiles. The ideal candidate will hold a Ph.D. in synthetic organic chemistry and may have conducted (although it is not a requirement) post-doctoral research on a synthetic or biological project. The successful candidate will have an excellent scientific publication record and national reputation as a leader in his/her chosen field. The role demands a highly goal-driven approach and the ability to focus on time-sensitive objectives. That's cool. Full posting here. Best wishes to those interested. ACS also hopes to contribute to safety awareness beyond our campus walls through its publishing activities. Starting at the beginning of 2017, all ACS publications will require experimental details to address and emphasize any unexpected, new, and/or significant hazards or risks associated with the reported work. There are two different important aims in asking for this additional information. First, as the primary source of chemical information, it is crucial that we use the literature to educate researchers about the risks inherent in the experiments we publish. Second, we hope that making this information required and widely available will change how this and future generations of scientists think about safety as integral to their role in the chemical enterprise. It is a professional requirement and a chemist’s responsibility in this world. Just as experimental details are turned into lab notebook entries for future findings, the community will then implement these better habits in their own papers and continue to catalyze the responsibility for safety throughout our industry. Finally, we do not want the most crucial of these safety notes to be sequestered only in the experimental sections. Particularly when unanticipated hazards or risks become apparent in the process of scientific inquiry, either in data acquisition or analysis, we want authors to highlight that information in results and discussion sections, perhaps even in the abstract. Seems like a good idea. Readers, what do you think? Matt Francis, orchestrator of those brilliant turkey banquets from my intro, both talks the talk and walks the walk. Every year, he held a legendary hands-on training session for new students showing them proper Schlenk line technique. This is the kind of activity that most of us delegate to postdocs or senior students but perhaps shouldn’t in light of what happened at UCLA. Matt’s effort to ensure that students know how to safely manipulate air- and/or moisture-sensitive, often flammable reagents under vacuum may have spared them from countless accidents and injuries. This kind of hands-on training from a senior PI is invaluable. This is a depressing post about mental health. I'd love it if you were to give me advice on this; if you don't want to read it, I won't be offended. They use asbestos diaphragms in the chlor-alkali industry? Lisa Jarvis covers the sola failure at Lilly. For those interested in contests, looks like a group of companies are sponsoring a content for new cosmetic preservatives. Interesting article by Jyllian Kemsley on the tuition-related protests in South African universities, and their effects on chemistry departments. Beth Halford's always beloved holiday season gift guide. I find the inflatable DNA oligomer to be particularly cute. As always, I am incredibly thankful for my family, my friends, my community (physical and online) and my job. 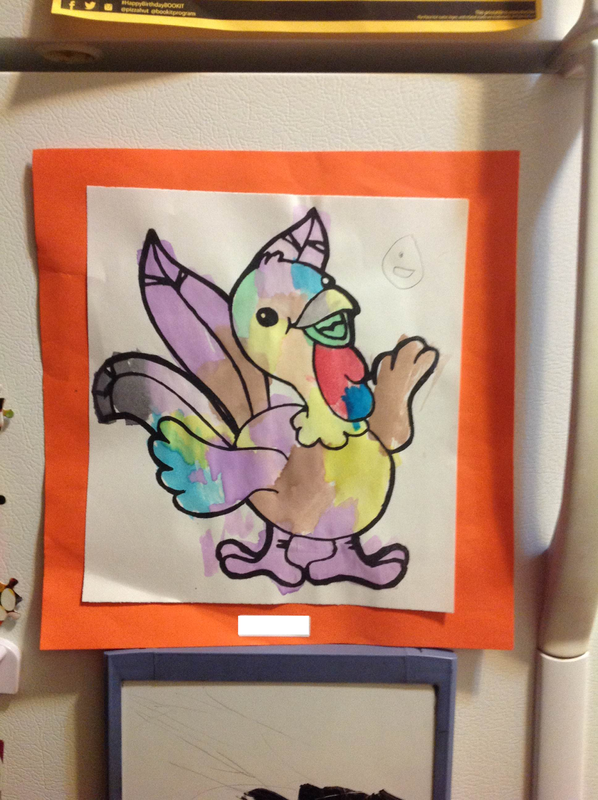 This particular year, I am very thankful for the health of my immediate family. I am also incredibly thankful for you, my readers and commenters. Thank you for your reading, your advice, your e-mails and your brilliant, insightful comments. I am truly blessed. 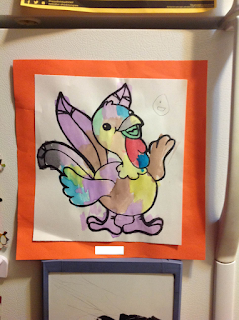 My family and I wish you a very happy Thanksgiving and if you're not in the United States, a happy Thursday and Friday! Anonymous writes, "It's the view from our lab at BC and you can see the Hancock and Prudential buildings in the distance." In the news this week, you may have heard that a federal judge suspended implementation of the new Department of Labor FLSA rule regarding overtime thresholds, the one that would have made academic institutions either 1) pay their postdoctoral fellows at or above $47,456 or 2) track their hours and pay overtime for any hours more than 40 hours a week. In my opinion, this best place to look for up-to-date information on this is Gary McDowell's Twitter feed. He's the head of Future of Research, a non-profit working on scientific labor issues. They are tracking the wildly divergent responses from academia on this issue; decisions are being made on day-by-day (if not hour-by-hour) basis. Most relevant to readers of this blog is the announcement that the University of Illinois system is suspending the planned salary increases to postdoctoral fellows. As far as what may come, I believe all this legal wrangling is moot. The House of Representatives had already made some noises about suspending the FLSA rule, and it is my strong presumption that, on inauguration, President Trump will cancel this rule on the first day in office. That said, we have no real sense as to President Trump's policies on the overtime issue. I also believe that academic institutions have already figured out how they will deal with this for the coming calendar year, and that the more financially stable institutions (read: private universities) will keep those planned increases, and public universities will choose not to increase their postdoc salaries, or will require tracking of hours worked above 40 hours a week. But who really knows? Has anyone found one of those Lego scientist minifigs? Did you know there's no aloe vera in WalMart aloe vera gel? There's this chemistry professor who's written a book about the chemistry of the kitchen! What the heck is the Mannequin Challenge, anyway? No, there's no such thing as a scientist shortage. That book called "The Chemist" by Stephenie Meyer? It's not very good. That thing about tryptophan - that's not really true. There's a family that's had a white streak in their hair for 200 years! Did you know that median chemist salaries have lost ground against inflation for ten years? No, I don't think there's a cure for Alzheimer's yet. Hey, what was the name of that Adele song? You can use NMR to track aloe vera contents - who knew? ...The tests used a technique called nuclear magnetic resonance. It found additives such as maltodextrin and other ingredients, like triethanolamine, an emulsifier. In all the samples, lactic acid, a component that indicates degraded aloe vera, was absent. I was rather skeptical of this, but lo and behold, some Nestle co-workers demonstrated this was possible in 2005. Also, here's this wonderfully rich NMR blog (that I was sadly unaware of) by Process NMR Associates LLC that has some very nice spectra of aloe vera that shows it is quite possible to distinguish the varying components of aloe vera. Note: I, for one, strongly support the idea of reporters purchasing the services of chemists to check products for quality and authenticity. The 2017 Chemistry Faculty Jobs List (curated mostly by Andrew Spaeth, with minor help from me) has 487 positions. Rolla, MO: Brewer Science, looking for a M.S./Ph.D. analytical chemist (3-5 years experience) to manage an analytical laboratory. Washington, DC: DC-area law firm (Keller and Heckman, LLP), looking for a toxicologist. Los Alamos, NM: "The Physics and Chemistry of Materials group of the Theoretical Division of Los Alamos National Laboratory is seeking candidates for one or more postdoctoral positions in the areas of electronic structure theory, principally density functional theory (DFT), and molecular dynamics (MD) simulation with applications to complex fluids, warm dense matter, and dense plasmas." New Paltz, NY: State University of New York at New Paltz has an opening for an assistant professor of inorganic chemistry. Boston, MA: Northeastern University is searching for an assistant or associate professor of analytical chemistry. Portland, OR: Oregon Health and Science University is looking for an assistant professor, searching for those "interested in merging chemical biology and physiology with the goal to develop and use techniques that will further our understanding of diseases and their underlying mechanisms." Huh. Irvine, CA: Chapman University's School of Pharmacy is hiring an "Assistant/Associate Professor of Natural Products and Alternative Medicine." The "alternative medicine" bit is interesting. New York, NY: Columbia University's Nano Initiative is looking for postdocs. Corvallis, OR: Oregon State University is hiring a nuclear chemistry postdoc, looks like. Originality and wit cannot be summoned on command on a weekly basis—I understand that. But if Editor-in-Chief Bibiana Campos Seijo cannot come up with something meaningful to say in her column, it’s perfectly all right to forgo the column every now and then. Fill the space instead with letters to the editor or with readers’ photographs of the views from their laboratories. Filling a page of a respectable publication with illiteracy-promoting drivel was an unfortunate choice. Bethany Halford covers the Du Bois synthesis of batrachotoxin. I didn't know about the National Chemical Historical Landmark program, but I do now. I really enjoyed this long essay about the late Dave Weininger's life (inventor of SMILES) by Anthony Nicholls. Great profile of Kara Allen by Yanni Wang. Marshall Brennan's interview with Andrei Yudin. And his interview with Chenfeng Ke. Fun post from Carmen about red phosphorus. And one on Frederick Banting! Happy that th' Gaussling is still blogging! Good question from Mitch about chemical inventory systems. Great post from Ash about Jack Roberts and Dorothy Semenow. One person's view of chemistry as a major. Hey, check out some total synthesis from the Du Bois lab at NPR! Fun list of chemists on Twitter from Stu Cantrill. Check out Andy Brunning (of "Compound Interest" fame) on a "What Chemists Do" video. Again, an open invitation to all interested in writing a blog, a hobby that will bring you millions thousands hundreds tens of dollars joy and happiness. Send me a link to your post, and I'd be happy to put it up. American Ian T. Baldwin, a Cornell-educated professor of ecology in eastern Germany, received a summons from his local police chief in early 2008. Several other American academics were caught up in the investigation, triggered by an anonymous whistleblower. Public outcry prompted a change to the law, but after his close shave, Prof. Baldwin still doesn’t use his title in Germany. "We just cut what we're going to pay for in the future; we hope you don't mind." Ari Jacobs, a senior partner, global retirement solutions at Aon Hewitt, the company that manages DuPont's benefit programs, said moving from pension plans to defined contribution retirement benefits has become an industry-wide trend. "As workers became more transient in the 1980s, they appreciated the flexibility and access to account balances offered by defined contribution plans," Jacob said. "It's been a broad trend and companies have adjusted accordingly." The amount of passive voice and assumptions in those two sentences is just stunning. I'd rather Mr. Jacobs have said "We think we can get away with this, and we don't feel guilty." It's important to note that this particular policy change doesn't affect current DuPont retirees. Back in late 2014, when the company outlined plans to lay off 900 staffers in its WARN letter to the state, GSK had a sizable 2,500 R&D workforce in RTP. Today, a spokesperson tells me that’s dwindled down to about 400 as the company followed through on its cost-reduction plan. Hundreds of the workers were transferred to GSK’s CRO, Parexel, which promptly turned around and laid many of the same workers off in its own downsizing effort — outsourcing the layoffs, so to speak. “Today there is a very much reduced scale of R&D activity in RTP,” says the spokesperson for GSK. “What remains in RTP is some infectious disease research (including ViiV folks), late-stage research groups, regulatory and medical functions.” A “handful” of those people may still be in transition, she adds. GSK, though, is still investing heavily in R&D, as its $250 million lab project underscores. 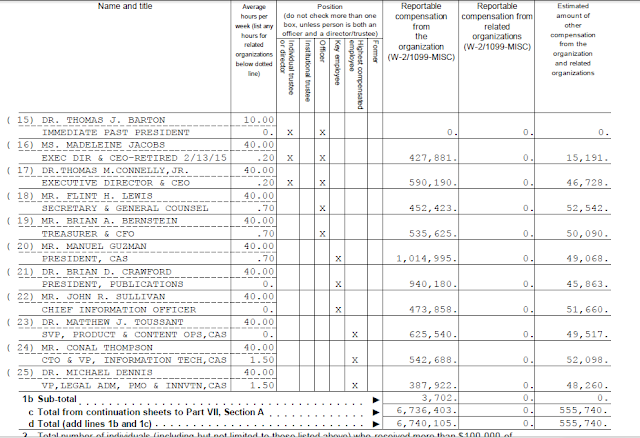 The company spends about $4.4 billion per year on R&D. Makeovers like this have become the rule rather than the exception in Big Pharma. Novartis’ latest rejigger happened weeks ago, as Merck was overhauling its ops with an eye to creating a new hub in the Bay Area. AstraZeneca is building a South San Francisco research hub as well. Pfizer long ago relocated much of its research staff into Boston/Cambridge, warning at the time that there would always be a focus on refining and changing in the face of new R&D priorities. Shire has been relocating staffers into its Boston-area HQ. And so on. So what happened to those 2,100 people? How many of those people left science? I suppose we'll never know. The inability of the media (including myself, I guess) to accurately measure headcount in pharma R&D is a continuing problem in being able to accurately quantify the quality of the chemistry job market; this is a disappointment. Research Triangle Park: AgBiome is looking for a M.S./Ph.D. formulations development chemist; 5-7 years experience desired. Washington, D.C.: ACS is looking for a manager for its Graduate and Postdoctoral Scholars office. Chattanooga, TN: Chattem Chemicals is looking for a B.S. synthetic chemist; 2-3 years experience desired. A broader look: Monster, Careerbuilder, Indeed and USAjobs.gov show (respectively) "1000+", 421, 9,906 and 28 positions for the search term "chemist." LinkedIn shows 1,354 positions for the search term "chemist" and 14,725 for the search term "chemistry." Job titles from LinkedIn - first with quotes, and the second without: Analytical chemist: 200/254. Research chemist: 28/40. Synthetic chemist: 14/373. Medicinal chemist: 12/41. Organic chemist: 25/54. Process chemist: 17/42. Process development chemist: 4/3. Formulation chemist: 43/44. ...The younger Mr. Shultz and Ms. Holmes met in late 2011 while he was visiting his grandfather’s house next to the Stanford campus. Tyler Shultz was a junior at Stanford majoring in mechanical engineering. Mr. Shultz interned at Theranos that summer and went to work there full-time in September 2013. He had just graduated after changing his major to biology to better prepare for a career at the startup, he says. One validation report about an Edison test to detect a sexually-transmitted infectious disease said the test was sensitive enough to detect the disease 95% of the time. But when Mr. Shultz looked at the two sets of experiments from which the report was compiled, they showed sensitivities of 65% and 80%. That meant that if 100 people infected with the disease were tested only with the Edison device, as many as 35 of them would likely incorrectly conclude they were disease-free. Mr. Shultz says he took his concerns directly to Ms. Holmes. When they met in early 2014, she encouraged him to talk to Daniel Young, a Theranos vice president in charge of biostatistics. There's a lot more to the story, including quite a bit of intrigue with lawyers and his family. Read the whole thing. One of the funny things about life is how early and often ethical dilemmas come. It seems to me that the younger Mr. Shultz acquitted himself well. Ask CJ: do I get to ask about funny gaps in references? If a person interviewing for a research assistant type of position has [5 to 15 years] of experience with a single employer as a technician, and followed that stint with attainment of a masters degree, is it fair to ask why none of their references are from their prior employer? I don't have tons of experience hiring folks, and to me it would make sense to not ask an old supervisor or colleague to be a reference after just a one to three year stint at some company, but for [5 to 15 years] with one employer, it's hard for me to see why one [of a number of] references wouldn't be with that organization. Is it fair game to ask an interviewing candidate how they spent [a long time] with one employer but did not wind up using them as a reference? This is an interesting question, and one that I'm not quite sure what the answer is. Seems to me that it would be perfectly reasonable for an employer to ask. That said, I would be prepared for some tap-dancing - if a person's old employer won't vouch for them, there might be something there. Then again, this is an interesting edge case, and I'm probably not imagining the right set of circumstances where it would be perfectly innocent to leave names off reference lists. Readers, what do you think? The 2017 Chemistry Faculty Jobs List (curated mostly by Andrew Spaeth, with minor help from me) has 470 positions. Baltimore, MD: So here's an interesting one: "Rapafusyn Research and Development" is looking for experienced M.S./Ph.D. medicinal chemists with 10 openings. Stemming from Johns Hopkins natural products research. Wilmington, DE: Incyte Corporation is looking for a Ph.D. medicinal chemist, with 0-2 years experience. (Zeroes!) "Post-doctoral experience is highly desired though not required." We are currently seeking a senior medicinal chemist with pre-clinical / clinical drug discovery experience to join us as a chemical toxicologist within the Predictive Compound Safety Group, a division of our Drug Safety and Metabolism (DSM) unit at AstraZeneca. Drug Safety and Metabolism (DSM) partners across the Innovative Medicine therapeutic area units for the optimization and selection of small molecules and new modalities as novel candidate drugs. As a medicinal chemist in the Predictive Compound Safety Group you will operate at the interface between medicinal chemistry design and drug safety, working alongside multiple project teams in the Oncology therapeutic area. In this role you will develop and apply your knowledge of medicinal chemistry in the toxicology arena to influence the quality and progress of drug discovery projects. You will develop a deep scientific understanding of mechanisms leading to compound-related toxicity through collaborations with AstraZeneca colleagues, as well as key external stakeholders. So this is someone with a Ph.D., probably 5-10 years experience? Washington, D.C.: One of the occasional test-writing positions that the American Institutes for Research posts. M.S., 1 year of experience desired. The Department of Chemistry at the University of Wyoming invites applications for a tenure-track position in organic chemistry. Individuals from all areas of organic chemistry are encouraged to apply including polymer chemistry, energy science and chemical biology. The position will be filled at the Assistant Professor level and candidates must hold a Ph.D. or equivalent with postdoctoral experience highly desirable. Expectations for the successful candidate will include: excellence in teaching at the undergraduate and graduate levels, nationally recognized and externally funded research program and participation in departmental and university-wide governance. San Diego, CA: Point Loma Nazarene University is searching for an assistant professor of physical chemistry. Manhattan, KS: Kansas State University is searching for an assistant professor of synthetic inorganic chemistry. Syracuse, NY: The State University of New York, College of Environmental Science and Forestry is looking for an assistant professor researching "renewable materials/organic chemistry." Montréal, QC: Concordia University is hiring an assistant professor of inorganic materials chemistry. "New Brunswick/Piscataway": Rutgers, looking to hire an assistant professor of organic chemistry, broadly defined. Edwardsville, IL: Southern Illinois University Edwardsville, searching for an assistant professor of biochemistry. 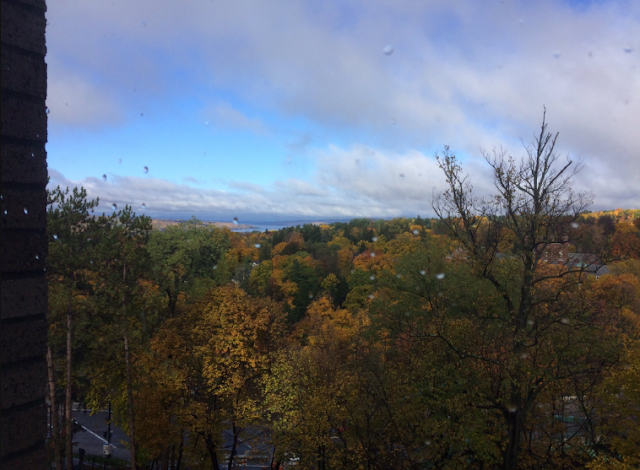 Northampton, MA: Smith College, looking for a teaching/research postdoc. Evanston, IL: Northwestern University is hiring a lab director of general chemistry. 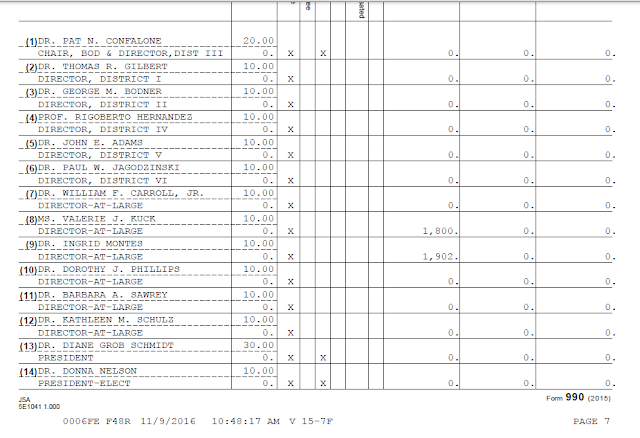 I see that just about all officers had high-single or double-digit increases in their pay. The cost-of-living in the DC metro area must have gone up. Overall ACS member unemployment is down from 3.1% in 2015 to 2.6% in 2016. 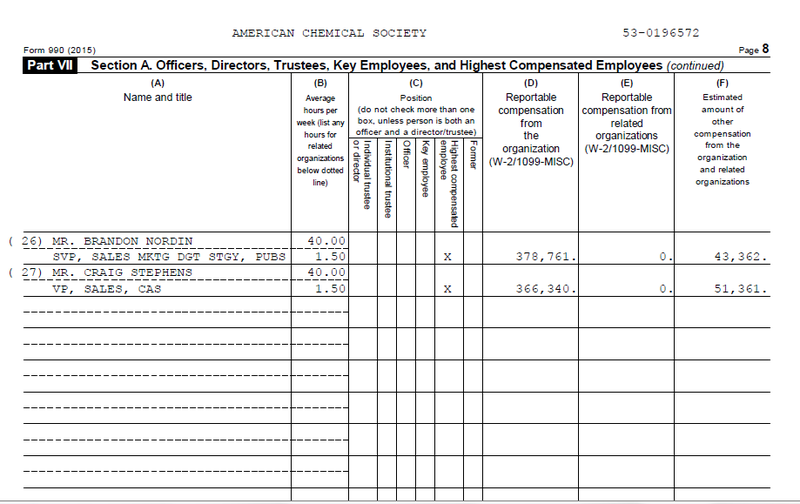 The median ACS member salary was $97,850, which is up slightly from $97,000 in $2015. The median industrial ACS member salary was $116,000 in 2016, up from $112,996. The median government ACS member salary was $107,615 in 2016, down slightly from $108,987. The median academic ACS member salary was $80,000 in 2016, up from $76,000. 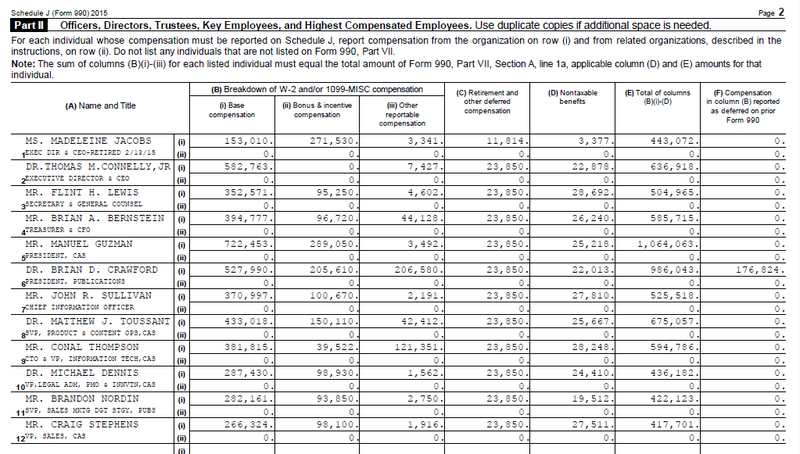 Overall, men ($105,000) make more than women ($81,000). 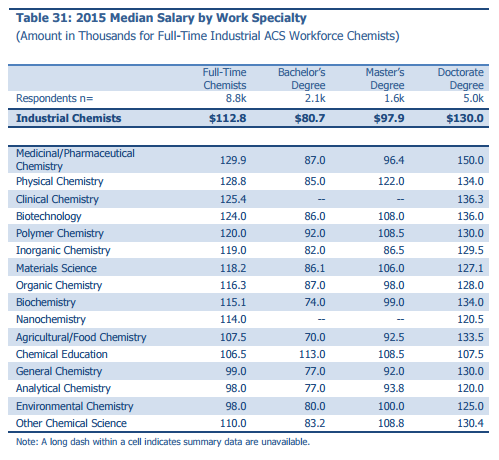 Chemical engineers make more than chemists ($123,000 versus $97,630). 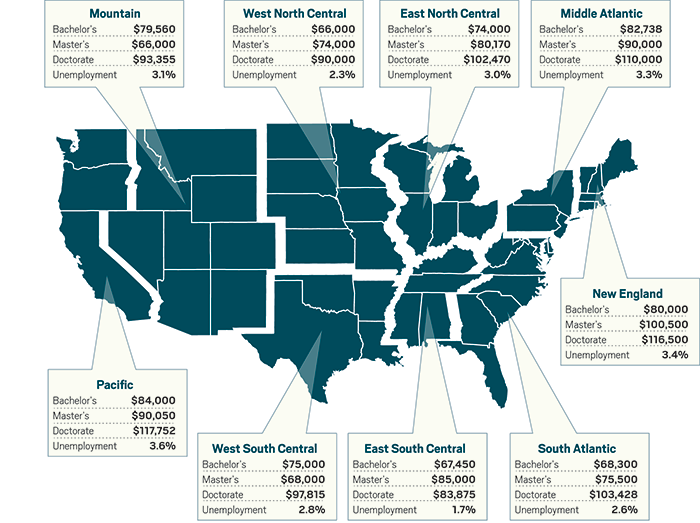 The highest salaries and unemployment (3.6%) were in the Pacific (California, Oregon and Washington) area. The median age of respondents was 49; 32% of them were female. Interestingly, ~25% of the industrial respondents work in the pharma/fine chemicals/specialty chemical space. There were ~twice as many female respondents who are adjuncts or secondary teachers. I refrain from making predictions routinely, but last year I was saying things like "2016 will be a better year than 2015", which I think is vaguely borne out by this data. I would not be making any such predictions about 2017 - the direction of GDP and political risk (thanks, Paul Hodges!) are simply too fuzzy for me. We are seeking an experienced R&D Science & Engineering, Materials Scientist with a Ph.D. to join our efforts developing new organic-based radiation detection materials and understanding the use of organic materials in ionizing radiation environments. The successful candidate is expected to have knowledge and experience related to the design, synthesis, and characterization of fluorescent polymers, light-emitting organometallic compounds, and/or organic luminophores. Experience with detailed photophysical and microstructural characterization is also required. The candidate must have a working knowledge of the interaction of ionizing radiation with organic compounds. The candidate must show aptitude with verbal and written communication and have a publication record commensurate with the above activities. On any given day, you may be called on to: Interact closely with an interdisciplinary team comprising computational/synthetic chemists, physicists, materials scientists, and product engineers will be utilized to understand and harness fundamental structure-property relationships for improved materials performance. Ph.D. in Chemistry, Materials Science, Nuclear Engineering, or a related discipline. Extensive experience related to the synthesis and photophysical characterization of organic and organometallic compounds; understanding how ionizing radiation interacts with organic and organometallic compounds. Full job posting here. Best wishes to those interested. More on the aftermath of Election 2016, with a look at legal marijuana and the plastic bag ban in California. Very interesting overview of the Li-ion battery space by Mitch Jacoby, with an eye towards removing flammable organic solvents from them. Via friend of the blog James Ashenhurst, I am pleased to have been introduced to Dr. Edwin Villhauer, a former Novartis medicinal chemist who has started his second career as a high school teacher of chemistry. This post has been lightly edited for grammar, and checked by Dr. Villhauer for accuracy. Can you tell us a little about your educational background? I obtained a Ph.D. in Organic Chemistry from the University of Rochester and immediately jumped into the pharmaceutical world on July 1st, 1985. Up until that time, life was macaroni and cheese, 17 hour days working in the lab, and wearing blue jeans with many holes due to acid burns. Who knew that my jean style back then would become today's fashion! When I entered Sandoz (merged with Ciba-Geigy to become Novartis in 1996), I started on a fantastic metamorphosis to becoming a medicinal chemist which is critical if you expect any possible chance of championing your little molecule from idea to market. The transformation from bench chemist to a fully functional medicinal chemist with confidence to maneuver through the foreign lands of pharmacology, toxicology, drug metabolism, patent law, regulatory, formulation, and process development took about 10 years. The election of Donald Trump as U.S. president and a Republican-controlled Congress portend impacts to the chemistry enterprise. In addition, state ballot measures also decided in the Nov. 8 election will affect the burgeoning analytical testing industry that’s grown around legal marijuana. With Trump in the White House and Republicans controlling both chambers of Congress, cuts in federal spending are likely. This means chemistry researchers are apt to see the dwindling of federal grant money from the National Science Foundation, the Energy Department, and other federal agencies. Budget cuts would also limit the abilities of federal agencies to regulate, which could trammel the chemical industry’s expectations for modernized regulation of its products. With tightly limited resources, the Environmental Protection Agency could struggle to implement Congress’ revisions earlier this year to the Toxic Substances Control Act (TSCA), which had strong backing of chemical manufacturers and product formulators. UPDATE: Here are President-elect Trump's answers from ScienceDebate.org. UPDATE 2: Here's some speculation about the EPA transition team from Scientific American. Mostly climate-oriented comments, deregulation-inclined. UPDATE 3: Here's an item from the Healthcare page of the official transition website: "Reform the Food and Drug Administration, to put greater focus on the need of patients for new and innovative medical products"
As of 2 AM Eastern, neither candidate has conceded, but it's pretty clear that my predictions were wrong, and Donald Trump is likely to be elected President. It looks quite clear that we will have a Republican Congress. So - what does that mean? How much of his agenda will be enacted, and how much of it will be relevant to chemists? I predict poorer funding for both NIH and NSF (more cuts at NSF than NIH, I suspect), and I predict emigration of scientists from the United States to their countries of origin. It's hard to see how macroeconomics will go. He made noises about raising interest rates, but I could easily imagine his tune on the Fed changing. I personally would love $30/barrel oil (I figure that would drop gas well into the $2.50/gallon range or below), but I don't see that happening either. Of course, as it turns out, Donald Trump is indeed the GOP nominee and we actually did get $30/barrel oil. Paul Hodges was right, and I was proven wrong. A week ago, Proposition 61 looked like a sure winner for its advocates. With sentiment running strongly against Big Pharma companies, polls showed plenty of support for a ballot measure in California that would cap drug prices for the state at the level that the Veterans Administration reaches through price negotiations. Assuming this is true, and Big Pharma faces political risk to its revenue model in the future, it seems to me we may see this reflected in future hiring. The 2017 Chemistry Faculty Jobs List (curated mostly by Andrew Spaeth, with minor help from me) has 460 positions. This position is envisioned as a long-term appointment for an innovative teacher, with an initial appointment term of four years. This colleague will be responsible for teaching sophomore-level Organic courses, such as CHEM 261, 262, and 262L, as well as General Chemistry, CHEM 101 and 102, and will also be expected to be involved in curriculum development, laboratory course development, serve on committees, and engage in departmental activities outside of teaching. Candidates must have a Ph.D. degree in Organic Chemistry. Candidates with postdoctoral experience, experience with or a strong demonstrated interest in innovative and evidence-based teaching methods, and experience in laboratory curriculum development will be considered most competitive. The ability to teach introductory courses in biochemistry or inorganic chemistry is a plus, but not required. Full posting here. First contract is for four years. Best wishes to those interested. "Bay Area": Henkel is looking for a M.S./Ph.D. chemist to be a technical lab manager in aerospace adhesive applications. 100-140k offered. Long Island, NY: Brookhaven National Laboratories is looking for a scientist in catalysis and surface science. Just a very few: Things are slowing down, it seems. Cullowhee, North Carolina: Western Carolina University is looking for an assistant professor of forensic chemistry. Montreal, Canada: McGill University is looking for an assistant professor in materials/nanochemistry. Shanghai, China: NYU Shanghai is searching for a professor of theoretical or computational chemistry; open-rank. ...And if that is truly the case, what role can the ACS Committee on Ethics play as we go forward? The first and most obvious role is in providing more opportunities for education on ethics. The ethics committee was formed in 2006. That year, it held its first symposium on ethics at the Southeastern Regional Meeting of ACS (SERMACS) in Augusta, Ga. That ethics symposium has evolved into half-day ethics workshops that are now held at both national and regional meetings. The committee continues to survey the landscape to cosponsor and/or develop symposia that reflect current “hot topics” in ethics. Symposia topics in the pipeline include publishing and authorship, patents and discovery, and nanotechnology. We welcome your input to help identify topics. We are also able to provide help in the form of subject matter experts where appropriate. ...The very nature of ethics is personal. Ultimately, we can only control our own actions. The Committee on Ethics does not adjudicate; we facilitate. We don’t judge; we educate. Our goal is to provide you with the information needed to help you make the ethical choice. You can contact me (keithv@cameron.edu) or Eric Slater, our staff liaison (e_slater@acs.org) with information pertaining to anything that you believe the committee should actively promote. What are the most ethical approaches to dealing with letters of recommendation? How much promoting should one do for the people that you're writing letters for? What are the ethical obligations to one's customers? If you had to rework their material to get it in-specification, are you obligated to tell your customer? What are ethical obligations to one's employers? If you're thinking about leaving for another employer, how much warning should you give them? Do those extend to the organization, or just your supervisor? Huh, this is fun. Readers, I'll bet you can come up with a few of your own. Cover: Stephen K. Ritter on with a profile of prominent cold fusion researchers. I don't understand why a retired synthetic organic chemist was the voice of skepticism. Surely there were nuclear chemists willing to throw cold water on this field? This idea to prominently post the employer's consequences for safety violations might be a good one. The "underemployed in a nonscience job" part makes it. A new chemistry-oriented subreddit for organic chemistry. A new "What Chemists Do" with Chris Bianca, JRF America pesticide research chemist. 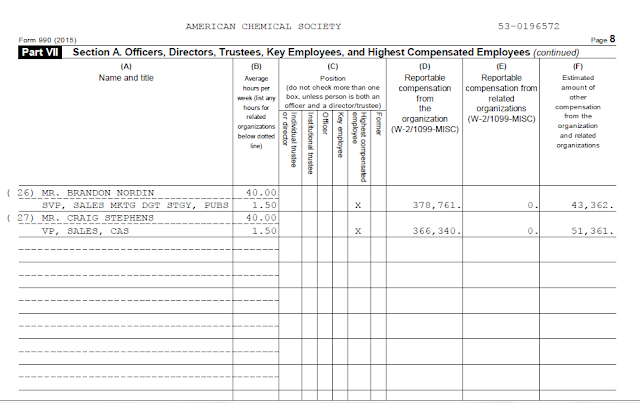 Ash on a really bad year for prominent chemists. Also, Ash on the Fermi method. German chemistry jobs, Halloween edition. A bunch of new chemistry podcasts from Chad. Retraction Watch: Who wrote this chemistry paper? Remember, on the internet, no one knows if you're a dog (or a duck). Kat Day asks, "What is a chemical?" Lots of great new entries at The Sceptical Chymist. Also, lots of fun tweets at RealTimeChem week. You can get a DNA match on cremated remains? ...Investigators said that Mr. Kaiser told them that he tries to scatter the ashes discreetly so as not to cause alarm. He had walked out of the opera house gone to dinner, and hoped to return for the evening performance, the official said. The police, in consultation with the Met, decided not to charge Mr. Kaiser with a crime. You can test to figure out whether or not cremated remains are human? Thanks to John Campbell on Twitter, I have discovered that there's a DNA test for cremated remains. I presume this is PCR-related? I'm a little skeptical for that DNA can survive cremation, but who knows? Interested in pursuing a career in computational chemistry or cheminformatics? Join us for a panel discussion by young career scientists in industry, ranging from big pharma to startups. Learn more about the field as well as tips and tricks for successful interviewing, networking, and job hunting. Hear what it's like making the transition from academia to industry and what it's like day-to-day working in this growing field. Followed by a networking reception at a nearby watering hole which is open to all (aspiring) modelers. 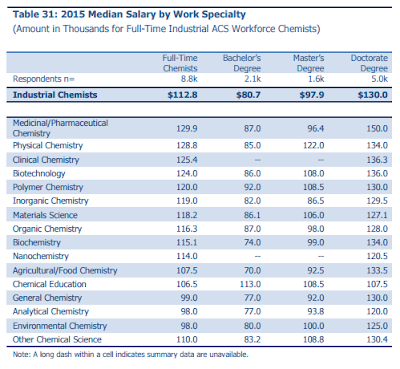 Just a random perusing of the 2015 ChemCensus (the once-every-five-years salary survey of all domestic American Chemical Society members.) The response rate for the 2015 was ~33%, I estimate. 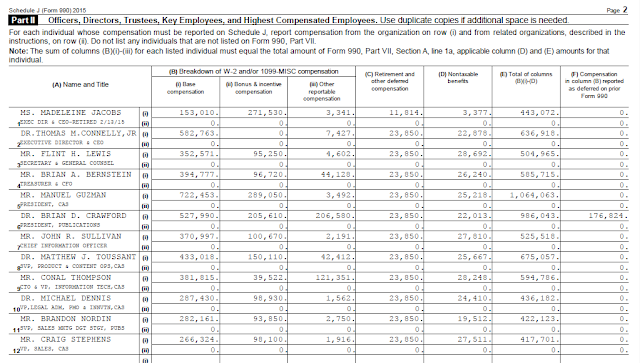 Seems to me to be reasonable that the pharmaceutical/medicinal chemist types show the highest pay. A broader look: Monster, Careerbuilder, Indeed and USAjobs.gov show (respectively) "1000+", 394, 9,737 and 20 positions for the search term "chemist." LinkedIn shows 2,343 positions for the search term "chemist" and 14,029 for the search term "chemistry." Job titles from LinkedIn - first with quotes, and the second without: Analytical chemist: 229/286. Research chemist: 33/43. Synthetic chemist: 15/427. Medicinal chemist: 12/49. Organic chemist: 26/64. Process chemist: 16/63. Process development chemist: 4/6. Formulation chemist: 37/41. You also did not thoroughly investigate sterility test positives. For example, your investigation of a sterility test failure for [redacted] injection (batch [redacted]) did not adequately assess the hazards in the aseptic manufacturing operation that led to the sterility failure. You also did not determine whether other batches made on the same production line were affected. an operator passing a pen directly over the stopper bowl to another operator. an operator sitting on the clean room floor during set-up of the filling line and not changing the gown after standing up. operators leaning against the cleanroom walls. an operator leaving the RABS [redacted] open for extended periods of time during filling line set-up, even when he was not working in the immediate area. The economics of general sterile injectable drugs seems to me to be pretty crummy. There's not going to be a huge margins on these drugs, and the regulatory burden is going to be (quite justifiably) very high. It's just gotta be a huge volume play, right? The 2017 Chemistry Faculty Jobs List (curated mostly by Andrew Spaeth, with minor help from me) has 442 positions. The Department of Polymer Science at The University of Akron seeks to fill a tenure-track faculty position in Polymer Chemistry at the Assistant or Associate (tenure) Professor rank beginning in August 2017. The ideal candidate would develop an active research program in supra or macromolecular chemistry, catalysis, catalytic polymerization, olefin polymerization and/or chemical methodology to control the microstructure and stereoregularity of macromolecular systems. Cambridge, MA: Nimbus Therapeutics, looking for both a director of computational chemistry and a senior medicinal chemist. La Crosse, WI: The US Geological Survey is looking for a research chemist for its Upper Midwest Environmental Sciences Center. "This vacancy is limited to the first 50 applications received and will close at midnight ET on the day this application limit is reached regardless of the closing date specified in this announcement." Huh, never seen that before. 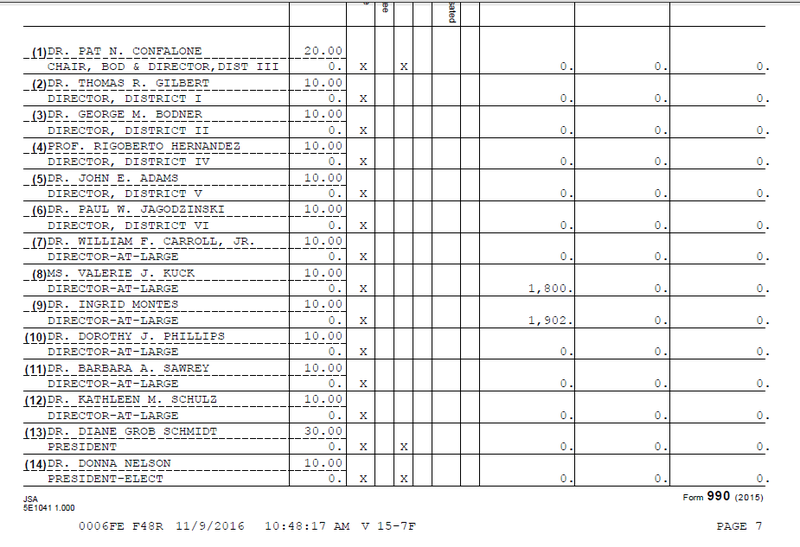 $71,012.00 to $129,723.00 offered - seems pretty good for Wisconsin. Ile De France, France: I can't figure out if this L'Oreal position is in the United States or if it's in France. Might be in both? Rolla, MO: Brewer Science, looking for a M.S./Ph.D. chemist to be a research associate/scientist. Albuquerque, NM: Sandia National Laboratories, looking for a synthetic organic chemistry postdoc. Houston, TX: Aramco Services Company is looking for a laboratory technician; A.A. accepted, B.S. in chemistry highly desired.